The Missguided website hasn't been working well recently so I've stayed away from it for a bit. I don't always read brand newsletters but when the Missguided one popped into my inbox I decided to take a look. I immediately saw this vest and it's gone straight into my bag! It's going to be so nice paired with some jeans or my disco pants or even tucked into a skirt! Big 'Tache fan! Ah i have this in black, wore it to death on my holiday! So many people ask me to hold the mustache up to where my mustache would be if I had one. Such a fun top! Its so nice and it isn't something too serious! Love it. Love your blog and the top. check out my big sis's blog, i think you will love it! LOVE THIS!!! So edgy and chic! This is super cute love it, you have such great style! I WANT THIS TEE AS WELL. ORDER PRONTO. Its been really obnoxious! I hope they fix everything soon.! 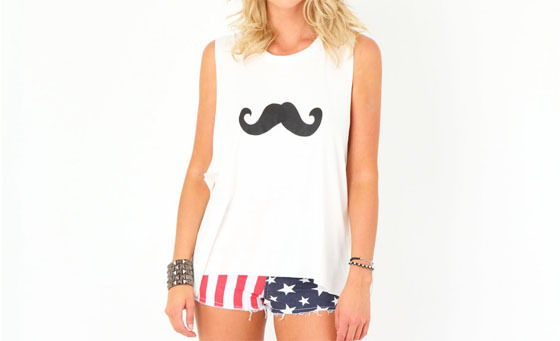 *Ps LOVE the mustache top.